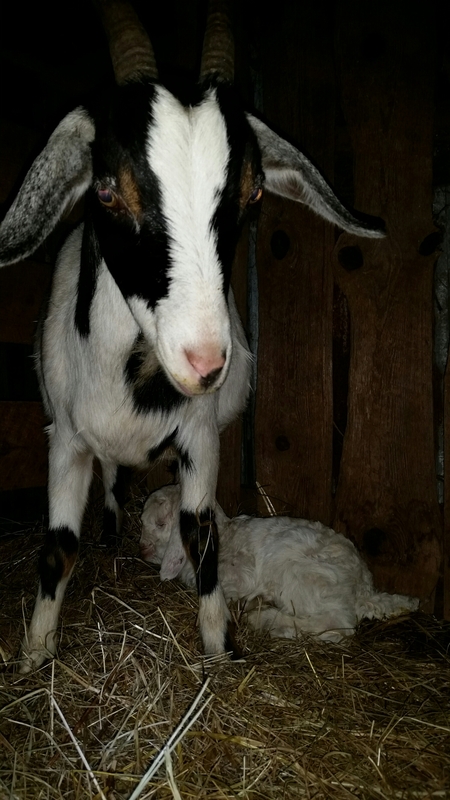 “ZsaZsa-Noel” was born at the farm Monday night at 7:30 pm and quickly sniffed by Pete the donkey. 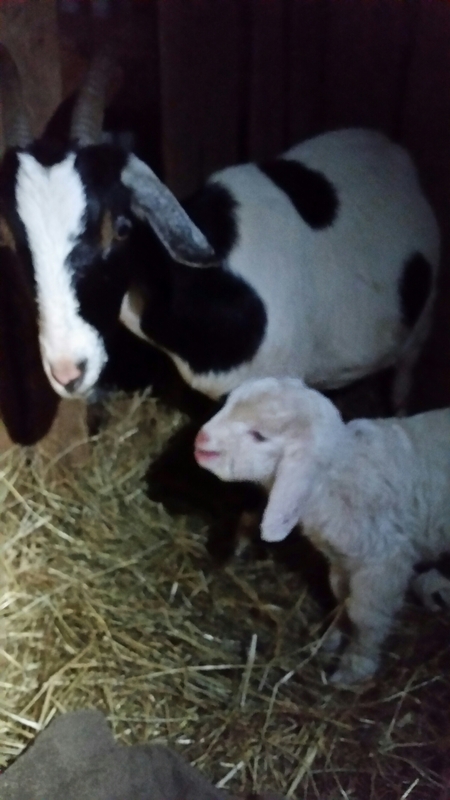 When Jim arrived home from work, he heard a goat scream, and headed to the barn to check on the animals. I filled the #vittlesvault with fresh cat food and secured the lid. Jim said, “Janet, you need to come here.” Walking closer, I heard the faintest bleating. My headlamp shone in the barn and a tiny white slick form wiggled in the corner. Connie Francis stood looking shocked and exhausted. 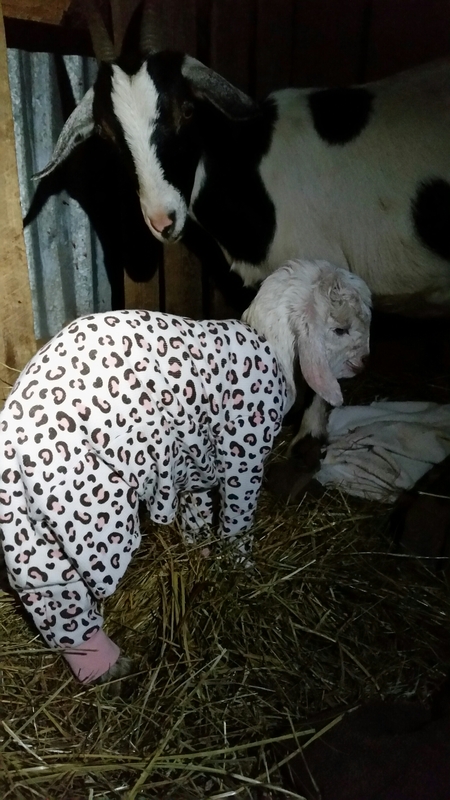 She had been the one bleating fifteen minutes earlier with labor pains that summoned Jim to the barn. I fetched old towels and returned to the barn as Connie Francis instinctually began cleaning the baby. Cautiously, I picked up the fresh baby and announced, “it’s a girl!” My phone was dying, but I used the last of the battery to show our new addition on Facebook Live. Quickly, friends began offering name ideas including Winter, Joy, Noel, ZsaZsa, Wobbles, Vanna White, Isabella, and Vera Sue. My phone battery died. Jim secured the “maternity ward” which separated the new mother and her kid to allow for bonding (and to keep them out of the woods). Jim headed back to the house to eat supper saying, “I’m going to call her Number Ten.” With my phone charging, I read him a few of the name suggestions, and we laughed. Jim went to bed, and I went back to the barn. Kelly came out, and we waited to see if another baby would arrive. Nothing. Kelly went back inside and I made one more trip to the barn. 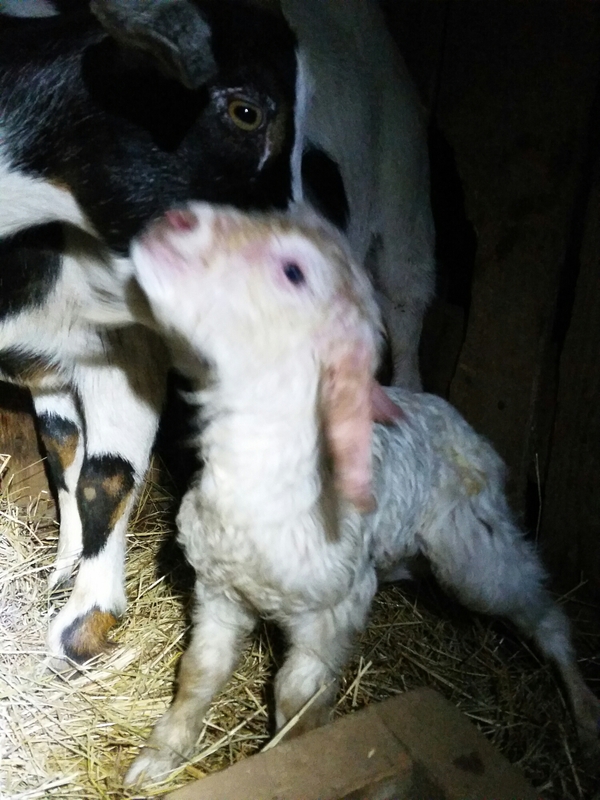 As I sat with mother and newborn in the chilly barn, waiting to see if she would deliver a twin, I heard coyotes in the nearby woods. Connie Francis looked around and stood over her baby protectively. I tried to outfit the new kid with a human-baby onesie. Connie Francis was not impressed, and we both agreed that alterations would be required. The donkeys, Pete and Ney, stood guard outside the barn with their ears pricked in attention listening to the nearby coyotes. By this time, it was nearly midnight, so I headed to the house to get some sleep. As I turned the barn corner, I noticed the barn cats sitting on a nearby stump and wondered why they were not in the barn. Then, I saw something gray run into the barn and I thought, “that’s a big gray striped cat….ohhhh…that’s the raccoon who’s been eating the cat food!” My mind ran wild with images of a raccoon hurling itself on my head or jumping out to scare me. Compounded by exhaustion, I began seeing monsters in the dark as sounds from the woods engulfed my senses. Collapsing into bed, I quickly fell asleep. It seemed too fast that my 5 am alarm sounded, and I headed back to the barn to check on the new pair. ZsaZsa-Noel appears to be a healthy little girl with big ears and an appetite. Her mother is protective and keeping the paparazzi (me) at horns-length. “These names”, people always ask, “how did you come up with these names?” The goats give me their names. Just the previous day, the actress, Zsa–Zsa Gabor died at the the age of 99. 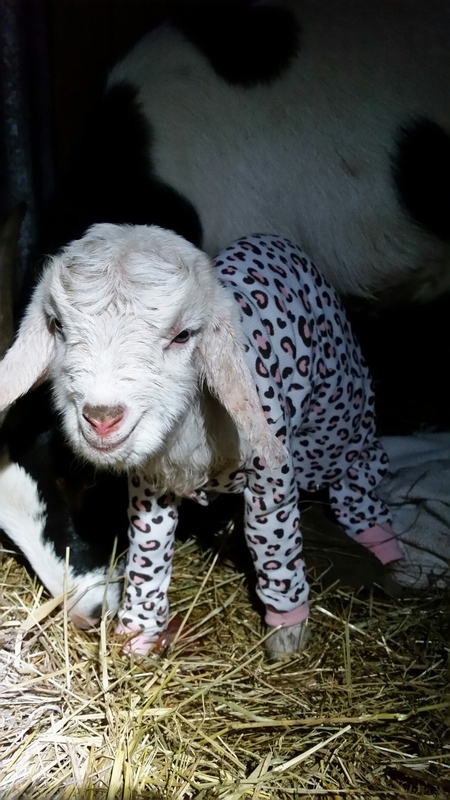 “ZsaZsa–Noel” fits perfectly with our famously-named goats and the Christmas season. I considered Belle (from Beauty and the Beast) as it would fit the Disney characters of Mary Poppins and Queen Lillian, and our twin trouble makers who were born to Julie Andrews in July. When we bought Faith, Gretel, Vera and Rita earlier this year, I wondered how the goat lady knew their names. To keep them straight, I altered their original names so that I could keep them straight. Faith became Faith Hill, Vera became Vera Wang, Rita became Rita Rudner, and Gretel..well, she became Julie Andrews because when she walks, she reminds me of songs from The Sound of Music. Now that I’ve been with the girls for nearly a year, I know their names like I know their spots. Each goat is named for an actor, comedian or musician whose work I like. Why would I name a goat after someone I don’t like? Previous Post It’s 8:15, Do You Know Where Your Kids Are?